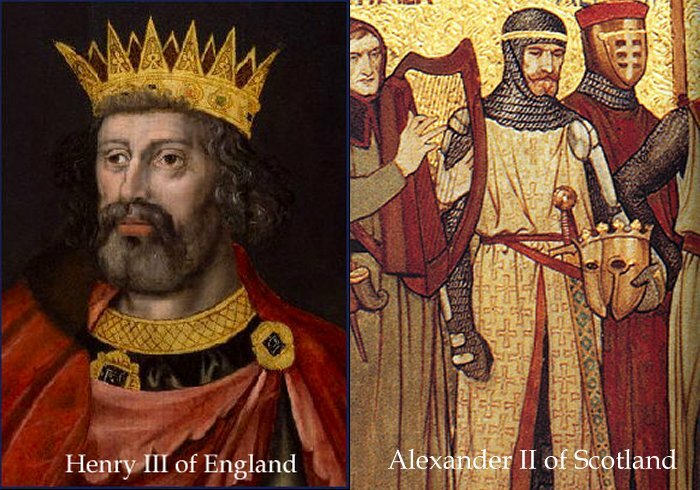 On this date in 1237, kings Henry III of England and Alexander II of Scotland, signed the Treaty of York, which affirmed that Northumberland, Cumberland, and Westmorland were subject to English sovereignty. This treaty established the Anglo-Scottish border in a form that remains almost unchanged to modern times (the only modifications have been regarding the Debatable Lands and Berwick-upon-Tweed). 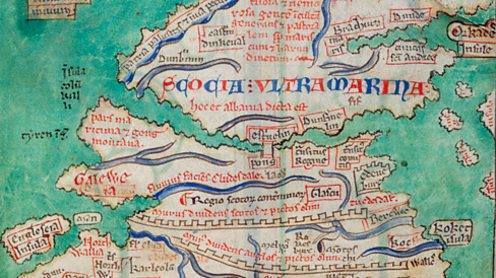 The treaty detailed the future status of several feudal properties and addressed other issues between the two kings, and historically marked the end of the kingdom of Scotland’s attempts to extend its frontier southward. The treaty was one of a number of agreements made in the ongoing relationship between the two kings. The papal legate Otho (also known as Oddone di Monferrato) was already in England at Henry’s request, to attend a synod in London in November 1237. Henry informed Otho in advance of the September meeting at York, which he attended. This meeting was recorded by the contemporary chronicler Matthew Paris, who disparaged both Alexander and Otho. Paris’ false allegations against Alexander, portraying him as boorishly uncivil and aggressive, have been repeated uncritically in several historical accounts. In fact, Henry and Alexander had had a history of making agreements to settle one matter or another, and they were, by and large, cordial because the two had strong kinship ties. Alexander was married to Henry’s sister, Joan, and Alexander’s sister Margaret had married Hubert de Burgh, a former regent to Henry. 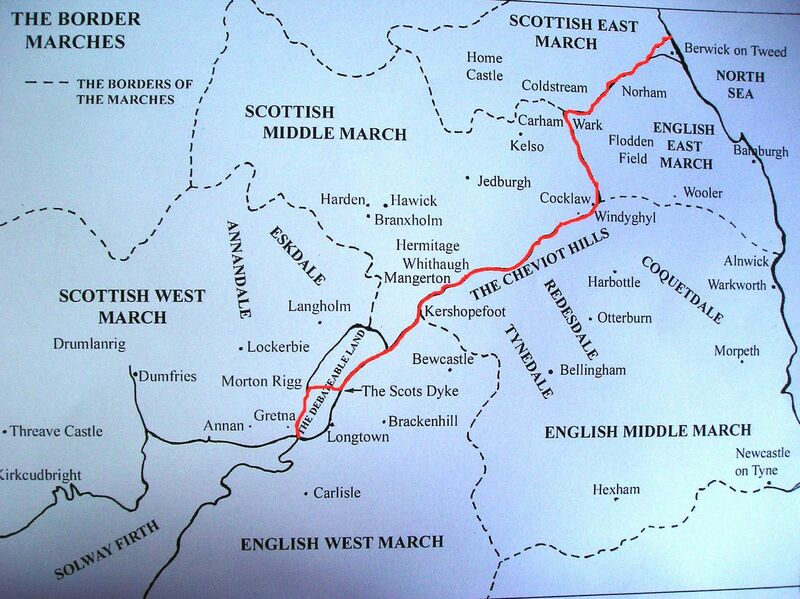 On 13th August 1237 Henry advised Otho that he would meet Alexander at York to conclude a peace treaty. Their agreement was reached on 25th September “respecting all claims, or competent to, the latter, up to Friday next before Michaelmas A.D. 1237”. The King of Scotland: quitclaims to the King of England his hereditary rights to the counties of Northumberland, Cumberland, and Westmorland; quitclaims 15,000 marks of silver paid by King William to King John for certain conventions not observed by the latter; and frees Henry from agreements regarding marriages between Henry and Richard, and Alexander’s sisters Margaret, Isabella, and Marjory. The King of England grants the King of Scotland certain lands within Northumberland and Cumberland, to be held by him and his successor kings of Scotland in feudal tenure with certain rights exempting them from obligations common in feudal relationships, and with the Scottish Steward sitting in Justice regarding certain issues that may arise, and these, too, are hereditary to the King of Scotland’s heirs, and regarding these the King of Scotland shall not be answerable to an English court of law in any suit. Both kings respect previous writings not in conflict with this agreement, and any charters found regarding said counties to be restored to the King of England. Older historians have shown little interest in the agreement, either mentioning it in passing or ignoring it altogether, and it still does not get much mileage in contemporary histories of relations between Scotland and England. Given that the treaty established a border that is still in effect 800 years later, you’d think it would have more prominence. Undoubtedly, the problem rests in the fact that for hundreds of years England and Scotland were at each other’s throats, so that the location of the border between the two countries was of minor importance in comparison with the rivalry between them. The waters are further muddied by the fact that the official chronicler Matthew Paris, (c. 1200–1259), who was known for his rhetorical passion and his invectives against those with whom he disagreed, did not like the participants for some reason. Paris describes the papal legate Otho in negative terms, as someone who was weak and timid in the face of strength but overbearing in his use of power over others, and as someone who avariciously accumulated a large amount of money. He describes Alexander and Henry as having a mutual hatred in 1236, with Alexander threatening to invade England. He describes the 1237 meeting at York as the result of Henry’s and Otho’s invitation to Alexander, and that when Otho expressed an interest in visiting Scotland, Alexander claimed no legate had ever visited Scotland and he would not allow it, and that if Otho did enter Scotland he should take care that harm does not befall him. Paris goes on to say that Alexander had become so excited in his hostility at the possibility of Otho’s visit to Scotland that a written agreement had to be drawn up concerning Otho’s visit. There is nothing in contemporary primary sources to support Paris’ vituperative account, and it is contradicted by well-known facts regarding dates and correspondences, and by information concerning previous visits to Scotland by legates. Legates had visited Scotland in the reigns of Alexander’s father William I, his uncle Malcolm IV, and his grandfather David I, and Alexander himself had seen a papal legate hold a council at Perth for four days, making his alleged outrage and threats incongruous and highly improbable. Despite the fact that Paris’ slanders are contradicted by the actual facts of the case, historians have frequently used them as reliable source material, and, hence, end up giving us a twisted analysis of Anglo-Scottish relations of the time. Borders drawn on a map by treaty are a decided curiosity. The inhabitants on either side of the line owe their national allegiance to political centers that are typically quite a distance from the borderlands, yet they are often culturally more alike one another than different. Such is the case of the peoples divided by the Anglo-Scottish border. Their dialects are similar, their occupations are alike because of a shared geography, and their cuisines show more similarities than differences. So, what is a good dish to celebrate a border that divides people who are culturally alike? You might want to debate this question yourself, especially if you have more than a nodding acquaintance with English and Scottish cooking traditions. I’m going to go with the noble kipper, a type of smoked herring that is produced in ports on either side of the border: the same, yet different. The harbor village of Craster in Northumberland is famed for Craster kippers, which are prepared in a local smokehouse, sold in the village shop and exported around the world. 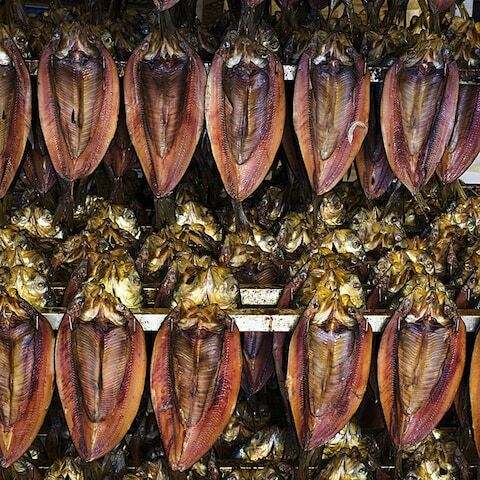 Likewise, the kippers from nearby Seahouses. On the other side of the border, kippers are produced in Dunbar and Eyemouth. The herring used to make the kippers in these towns is all the same fish, but the resultant kippers are markedly different. Which is better is a matter of personal taste. 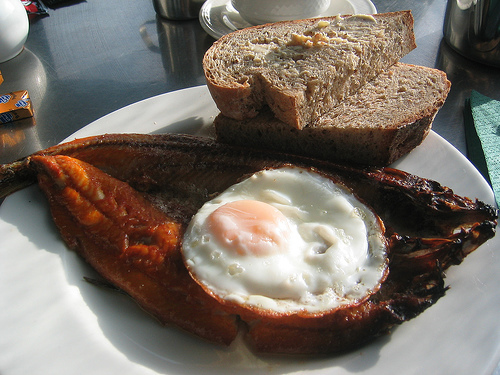 Kippers need to be poached or grilled before they are eaten, typically as a breakfast dish on either side of the border. I can’t say when the last time was that I had a kipper for breakfast, but my normal custom is to eat a whole fish, poached, with plenty of wholewheat bread and butter on the side. Some people like a fried egg in addition, but I find this habit to be a trifle overwhelming.